Flipping through my America's Test Kitchen DIY cookbook, I found a recipe for cultured butter that sounded intriguing. Adding yogurt into the cream introduces bacteria which gives it some tang. I was surprised how easy it was. 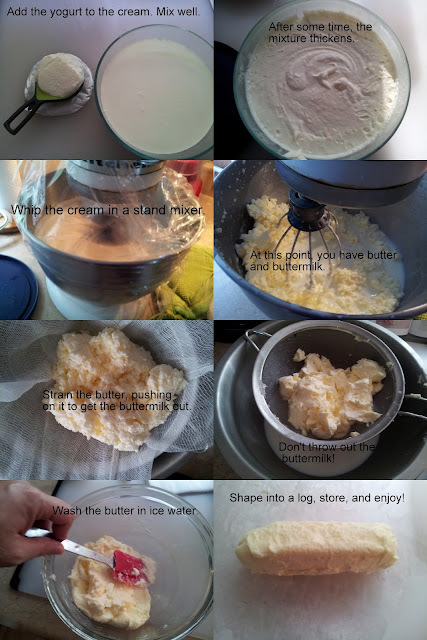 When I make my family's Christmas cookies this year (Vanilla Kipfels) I may try using homemade butter. 1/3 cup Greek yogurt (the recipe recommends Stonyfield Farms Greek Yogurt - I used the lowfat one. Make sure the cream and yogurt are at room temperature. Place the two in a large container, cover, and shake well. Remove the container and cover with a kitchen towel. Leave out in a location around 75 degrees for 18 to 48 hours until the mixture is thickened to the consistency of yogurt. Refrigerate for about 2 hours until the temperature of the mixtures is 60 degrees. Place 4 cups of ice water in the refrigerator (you'll need this after the cream is whipped.) Line a fine-mesh strainer with a triple layer of cheesecloth and place the strainer over a large bowl. Place the cream mixture in the bowl of a stand mixer fitted with the whisk attachment. Cover the stand mixer with plastic wrap - this is to prevent splatters, and there will be some! Whip on high speed until the cream separates into butter and buttermilk. You'll see spatters starting to hit the plastic wrap. It took about 3 minutes to get to this stage for me. Strain the butter through the cheesecloth. Push down gently with a spatula, then gather up the ends of the cheesecloth, gather the butter into a ball, and squeeze. The goal is to get rid of as much buttermilk as possible, as it can make the butter turn rancid quicker. Place the butter into a large bowl. Pure 1/3 c. of ice water over the butter, and use a spatula to mash the butter against the side of the bowl. Drain the liquid and repeat a few more times until the water runs clear. Transfer to a container for storage. I split my butter into two logs. One got wrapped in parchment and stored in the freezer. The other went into the fridge.